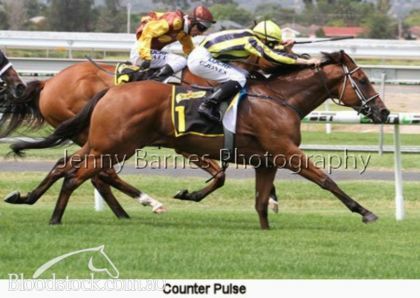 COUNTER PULSE is the extremely talented sprinter by HARD SPUN who's earnings have now exceeded the half million dollar mark with $513,500 in prizemoney. He is an 11 time winner from 1000m to 1250m with 10 of those wins either sitting 1st or 2nd in the run thanks to his combination of early speed and quick last 600 sectionals. 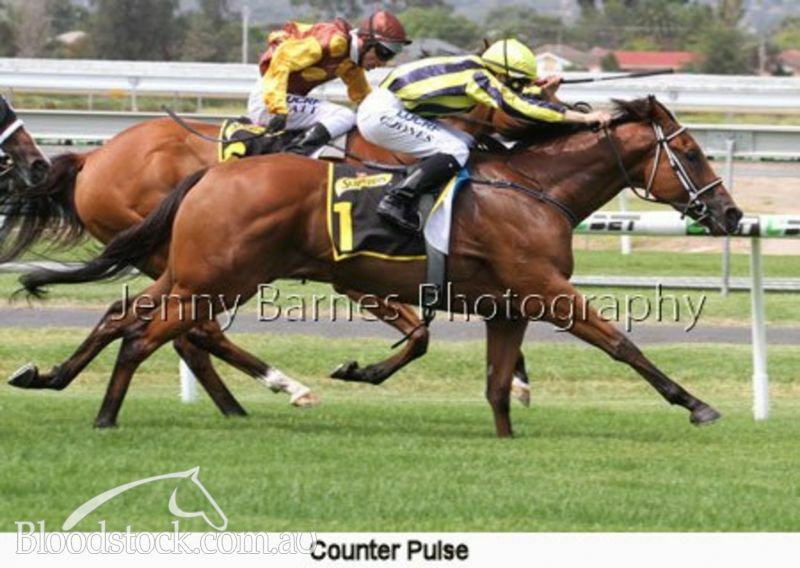 Counter Pulse has met some quality opposition in his career including multiple Group 1 winner VIDDORA only beaten 2.3L and although he hasn't won in his current prep he ran two close 2nd's when raced on the speed and was only 1.6 lengths off Holy Blade at Listed Level. As the stats show he has a love for a Good surface and boasts a good fresh record. For more information on this highly talented galloper please contact Royal Bloodstock. HARD SPUN (USA) (Bay 2004-Stud 2008). 7 wins-3 at 2, Saratoga King's Bishop S., Gr.1. Sire of 1074 rnrs, 757 wnrs, 69 SW, inc. Questing (Saratoga Coaching Club American Oaks, Gr.1), Le Romain, Hard Not to Like, Hard Aces, Ertijaal, Wicked Strong, Out for a Spin, Smooth Roller, Hardest Core, Zo Impressive, Promising Run, Gatting, Big John B, Rocketry, Moviesta, Fursa, Tarquin, San Nicasio, Red Duke, Text'n Hurley, Pleasuring, A Thread of Blue, etc. Counter Pulse (g by Hard Spun (USA)) 11 wins. See below. Counter Spin (g by Hard Spun (USA)) 10 wins to 1400m, A$346,710, to 2017-18, SAJC MAC Just Over Don't Drive H., Quayclean H., Produce Market H., Akeed Mofeed at Goldin H., Craig Clogg H., Peter Elberg Funerals H., Holdfast Insurance H., Schweppes H., Oakbank RC Just Over Just Don't Drive H., 2d SAJC Kate Dansie 50th Birthday H., CA Haigh Memorial H., Jenny Brunskill H., Schweppes H., Zanimal Tripod H., Final Furlong at Morphettville H., Mac Just Over Don't Drive H., Corporate Events at Morphettville H., 3d SAJC Carbine Club Autumn Final H., Warradale Hotel H., Steve Holloway H., Kadina Jewellers H., Mercedes-Benz Adelaide H., Mac Drink Driving Grow Up H., Brian Bloffwitch's 80th H., AAMI H., Irish Race Day H., Raelene Sands 70th Birthday H.
Counter Sign (g by Gonski) 4 wins-1 at 2-at 1000m, 1050m, A$168,210, SAJC Haigh's Chocolates 2YO H., Sloans Sands H., Sportingbet H., Sbet.mobi H., 2d SAJC Joel's Getting Married H., Distinctive Homes H., Centrebet H., Sportingbet H., Gary Radford & Sons H., Pro Paint 'n' Panel H., 3d MRC TROA Supports National Jockeys Trust H., SAJC Hi-Tech H., Sportingbet H., Reliance Tailem Bend 2YO H., Haus Hahndorf Cafe & Bar H., Express Colour Printing H., Congratulations Adam Scott H.
Counter Claim (g by Grandera (Ire)) 4 wins-1 at 2-to 1200m, 3d SAJC Wolf Blass & Associates 2YO P., Schweppes Fulham Park 2YO P.
Counter Drive (g by Bernardini (USA)) Placed at 3 in 2018-19, 2d SAJC Roadside Services & Solutions P., Adelaide Cup Raceday P., White Marquee P.
Able Win. 5 wins at 1650m, HK$2,986,375, HKJC Atlantic Ocean H., Blue Pool H., Broom H., Shan Kwong H., Tasmania H., 2d HKJC Huang He H., P&O H., Chevalier Building Supplies H., 3d HKJC River Avon H., Pak Wo H.
Silver Dollar (g Dash for Cash) 2 wins at 1100m in Malaysia and Singapore, Selangor TC Malaysia 3YO Championship Heat 1, Singapore TC IRT Juvenile S., 2d Singapore TC Aushorse Golden Horseshoe, L, Open 2YO S., 3d Singapore TC Novice S., Class 4 H., 4th Singapore TC Juvenile Championship, L.
Final Command (g Commands) 11 wins from 1100m to 1600m, A$173,070, SAJC Express Colour Printing H., Darley H., Distinctive Homes H., Alan Sheppard H., 2d SAJC CS Hayes Memorial Cup, L, Hino Trucks H., 3d SAJC Dominant H., CFMEU H., Adelaide Galvanising H., Brad's 40th Birthday H.
STICK AROUND (g Twig Moss) 5 wins from 1350m to 2200m, A$109,915, Pinjarra RC Millionaire Sires' S., Gr.3, Bendigo Cup, L, WATC Aclis H., Cottesloe H.
CHARM SCENE LAND (g Brocco) 2 wins at 2, A$182,660, VATC Blue Diamond Prelude (c&g), Gr.3, VRC Talindert S., L, 3d VRC Emirates Classic S., Gr.2, 4th VRC Maribyrnong P., Gr.2. KINGSGATE (g Danzero) 6 wins-1 at 2-to 1300m, A$573,640, AJC Show County H., L, 2d AJC Epsom H., Gr.1-twice. FIESTA (f I Am Invincible) 3 wins-1 at 2-at 1100m, 1200m, A$1,194,550, to 2018-19, ATC Silver Shadow S., Gr.2, Widden S., Gr.3, 2d ATC Flight S., Gr.1, Percy Sykes S., Gr.2, Tea Rose S., Gr.2, Sweet Embrace S., Gr.2, NSW Tatt's RC Furious S., Gr.2, 3d ATC Gimcrack S., L.
BRIDAL FALLS (f Lord Dudley) Winner. See above. Race Record: 43 Starts 11-4-3 A$513,500. 24/Oct/2014 5th of 7 --trial--SAJC Barrier Trial, 860m. Comprende was 1st and Miss Gunpowder 2nd and The Show Goes On 3rd. (7.5) SAJC Stamford Hotels H., A$100,000, 1200m, time 1:11.06. Track good(3). Carried 57.50kg. House of Wax was 1st and Telopea 2nd and Manhattan Blues 3rd. Trainer: L Macdonald & A Gluyas. Owner: Dr R G Lehman & Mrs J R Lehman. Jockey: Ms C Lindop. (4.2) VRC Country Achiever Gerald Egan H., A$100,000, 1100m, time 1:03.61. Track good(4). Carried 56.50kg. Ability was 1st and Husson Eagle 2nd and Rough Justice 3rd. Trainer: L Macdonald & A Gluyas. Owner: Dr R G Lehman & Mrs J R Lehman. Jockey: Ms C Lindop. 19/Jul/2018 7th of 11 --trial--SAJC Barrier Trial, 1000m. Callisto Girl was 1st and Delanann 2nd and Zalmona 3rd.